Cartoons in German language help people find love – God’s love and destiny. Cartoon network in German gives answers. Your destiny is your choice! 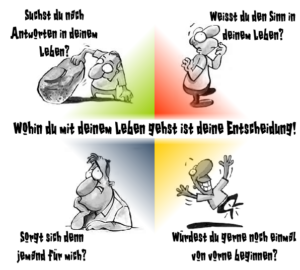 This PDF in German is composed of cartoons linking to one another taking you through the necessary steps in German to help you make a wise choice. Cartoons will help you understand how to be sure of your destiny and how to reach your God given potential. The reason why we chose cartoon pictures in German is because cartoons are a language everyone can understand and enjoy. In making a point some times words alone aren’t enough. A cartoon drawing communicates! By using cartoon art we have sought to make spirituality simple and fun. Phil Spratt, the cartoonist comments, ‘It is said that cartoons cause people to laugh for 5 seconds and think for 5 minutes, trust the cartoon characters will help you do just that! Enjoy the cartoon character and have a great day! There has to be more to life than this! Do you feel you are chasing money yet still feel unfulfilled? Lonely? Burdened? Missing something deep inside? There is an answer! Step 1. Click on the cartoon drawings below to open the PDF file. Step 2. Click here for a PDF in German to learn how Jesus can meet your needs. Step 3. Click here for a PDF in English with more cartoons to learn more about Jesus.